MOSCOW, Russia -- Kremlin officials reacted furiously Monday to the European Union’s extension of sanctions on Russia through January, calling the measure self-defeating and accusing the West of crass anti-Russian bias by timing the decision to the nation’s commemoration of the Soviet victims of World War II. 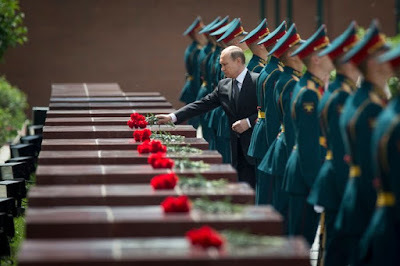 President Vladimir V. Putin in Moscow on Monday marking the anniversary of the Nazi invasion of the Soviet Union in 1941. The Russian government said it would retaliate with an extension of countersanctions in response to the decision by European Union foreign ministers, at a meeting in Luxembourg, which had been widely expected after European ambassadors reached a tentative agreement last week in Brussels. Russia had lobbied against the renewal of sanctions, which were first imposed in July 2014 in response to the Kremlin’s invasion and annexation of Crimea. Russia has tried not to flinch in the face of the sanctions, which have severely restricted the access of major Russian corporations to Western capital markets, among other punitive measures, but the country’s economy has suffered and continues to contract. Lower prices for oil delivered a concurrent blow, deepening the recession. In perhaps the most emotional in a barrage of responses by the Russian government on Monday, Sergei Ivanov, the chief of staff to President Vladimir V. Putin, accused the European Union of deliberately announcing the extension on June 22, to coincide with the Day of Memory and Sorrow, when Russia honors the victims of World War II. Ivanov, speaking to the Interfax news agency, also accused Belgium of announcing a plan to seize Russian assets last week in an attempt to mar the annual St. Petersburg International Economic Forum. “Unfortunately it doesn’t surprise me anymore,” he said. In response to the sanctions last year, Russia imposed a ban on most agricultural imports from Europe, dealing a severe blow to many farmers across the Continent and stripping Russian grocery store shelves of some favorite imports, including cheeses. Putin’s spokesman, Dmitri S. Peskov, in a less emotional statement to reporters on Monday, said that those countersanctions would be extended. “The principle of mutuality is the foundation of our approach,” Peskov said. Russia had not initiated any sanctions, he said, but had only responded in kind. The Foreign Ministry, in its own statement, accused the European Union of trying to minimize the harm that sanctions against Russia were causing to its own member countries, including reduced jobs. The ministry also accused the Europeans of bending to an anti-Russian lobby, apparently a jab at the United States, which had urged a continuation of sanctions to maintain pressure on the Kremlin over its intervention in eastern Ukraine. “We are deeply disappointed that once again the opinion of the Russophobic lobby, which pushed through the decision to extend illegal restrictions, dominated in the E.U.,” the Foreign Ministry’s spokesman, Aleksandr K. Lukashevich, said in the statement. Lukashevich also complained that the West was placing unfair responsibility on Russia for carrying out the Ukraine cease-fire agreement, which was signed in February in Minsk, Belarus. Russia has long insisted that the Ukrainian government bears the largest responsibility for the failure so far to put the accord in effect. “The E.U. keeps laying all the responsibility over the implementation of the Minsk agreements on the Russian side,” Lukashevich said. While the sanctions were originally imposed by the United States and the European Union, as well as Canada and other nations, to punish Russia for the invasion and annexation of Crimea, they have been viewed largely as an effort to dissuade the Kremlin from further intervention in eastern Ukraine, where it has backed an armed separatist insurrection. Western officials have generally spoken about the possibility of relaxing the sanctions once the Minsk peace agreement has been fully put in effect, but there has been virtually no discussion about the possibility of a Russian withdrawal from Crimea. Last week, Russian officials similarly criticized a decision by the European Union to extend economic sanctions restricting most business dealings with Crimea. Those measures have been extended until June 23, 2016. The Foreign Ministry said the restrictions would do little other than “punish” residents of the Crimean Peninsula for what it called their free, democratic choice to join the Russian Federation. The dispute over Russia’s actions in Ukraine has created some of the worst tension between the Kremlin and the West since the end of the Cold War, and anti-American remarks are quite common in Russian government circles.